Last year I was invited to serve as one of the “critics” in an “author-meets-critics” session at the annual meeting of the American Sociological Association in Montreal. The author in question is someone whose work I admire, Jennifer Carlson, so I gladly accepted. Putting together my list of top books on guns in America, I remembered that I have never given a comprehensive review of her work on this blog. Following, therefore, is the text of my comments on her book, Citizen-Protectors: The Everyday Politics of Guns in an Age of Decline (Oxford University Press, 2015). Good morning. I am honored to be here to recognize the publication of Jennifer Carlson’s important book, Citizen-Protectors. I’m an old sociologist, but new to the sociological study of guns. I got into the topic when I realized how common and how normal guns are to so many different people in North Carolina, where I moved a little over a decade ago. Entering the field, I was struck by how hard it is to find scholarship on the lawful use of firearms by legal gun owners. What James Wright observed over 20 years ago remains true today. The study of guns is dominated by the criminology and epidemiology of gun violence, which is a very small part of the social reality of guns, in American society at least. So I feel very fortunate that a friend of mine was stalking the Berkeley graduate student web page several years ago and found Carlson’s dissertation project focusing on people who legally carry firearms, which subsequently became this book. 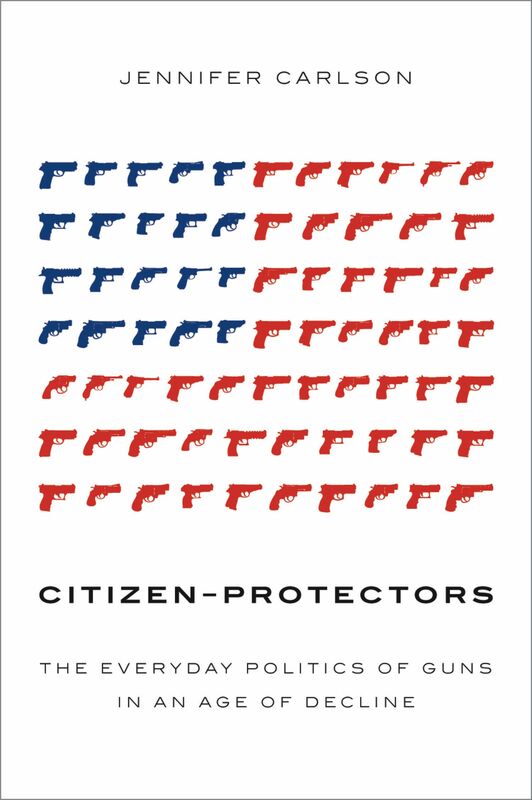 I have learned more about the sociology of guns from Jennifer Carlson than anyone since then, and I am excited to share some thoughts on Citizen-Protectors with you today. There is a lot more I could say, but I will limit myself to two main observations and some questions that follows from them. My first observation concerns the normality of Americans carrying guns outside their homes. The liberalization of concealed carry laws since the 1970s have further normalized – both culturally and legally –gun carrying outside the home. The 29% of handgun owners who carried outside the home in 1978 has grown to 57% today, according to a survey released by the Pew Research Center just two months ago. That is nearly 30 million people. As many as 16 million American adults, according to one recent count, have permits to carry firearms concealed in public. Carlson calls this a “gun carry revolution,” and she is right. And yet sociologists have been oddly silent about it. This is perhaps because it is hard to use criminological or epidemiological perspectives to understand law abiding gun owners engaging in a lawful action – although scholars have attempted to understand it that way, too. This is the void into which Carlson steps. In addition to her interviews, Carlson did 150 hours of participant observation at shooting ranges, activist events, and gun training classes. In the process she also obtained a concealed carry license, carried a gun during her fieldwork, and became a National Rifle Association (NRA) certified firearms instructor. In the best tradition of ethnography, she is a critical observer attempting to understand this aspect of American gun culture from the inside out. If sociologists want to understand why 30 million Americans carry handguns outside their homes and 16 million have concealed carry permits, we need to understand that this behavior solves problems for the people who engage in it. So the question becomes, what problems are solved by carrying a gun? Although she begins by arguing that “guns work to address real and imagined social, economic, and physical insecurities,” in my reading Carlson finds the real insecurities to be social and economic, while the physical insecurities are largely imagined. Where the physical insecurities are not imagined, guns can actually create more problems than they solve. The practical uselessness of carrying a gun is reinforced – unintentionally, perhaps – by the two cases in Citizen-Protectors in which individuals actually used their guns. Carlson begins her introduction with the story of Corey, a white, 30-something man who works the cash register at his family’s corner store in Flint, Michigan. One afternoon, Corey looked up from the register and found himself staring down the barrel of a gun. He responded by firing his own revolver twice killing the man who threatened him. The police ruled it a justifiable homicide but, like the police, Carlson holds back a detail of the case until much later. Where this first case of gun use frames the entire book, the second case is the focus of the entire final substantive chapter. We hear the story of Aaron, an African American father who Carlson characterizes as “a model gun carrier.” Aaron entered a gas station in suburban Detroit as a “good guy with a gun” and left it as a “bad guy” – arrested for felonious assault and eventually pleading guilty to a lesser charge of brandishing for pulling his gun on an unarmed woman. So, in Citizen-Protectors we have two cases in which individuals actually used their guns and both highlight negative outcomes: one person with a toy gun dead and one person becoming a criminal. At the outset I mentioned how hard it is to find scholarship on the lawful use of firearms by legal gun owners. And as much as she does focus on legal gun carrying, even Carlson could not resist the magnetic draw of the criminological and epidemiological approaches of connecting guns and violence. So, we know what problems are created by guns, but what problems are really solved by guns? The primary problems solved by carrying a gun in Citizen-Protectors have to do with identity. It’s not so much about what carrying a lethal weapon can do for you in any practical sense as what it says about you. So my questions for Carlson on this first point are: Was your focus on the politics rather than the pragmatism of carrying guns a reflection of reality, an analytical decision, or am I misreading your argument entirely? And why did negative outcomes figure so prominently in your argument, when those outcomes are the exception not the rule in gun carrying? My second observation is briefer and concerns the National Rifle Association. Not surprisingly, the NRA plays a central role in Citizen-Protectors. How can you write about American gun culture without considering the NRA? But Carlson’s take is entirely novel. She examines the NRA not as a national lobbying organization, but as a grass roots service organization promoting the citizen-protector identity through its gun training courses. “Service activities like hunting courses, competitive shooting events, and self-defense training,” Carlson observes, “continue to comprise much of the NRA’s organizational focus.” Just on the training side of the NRA operation, there are over 100,000 certified firearms instructors who train nearly one million Americans a year. To use an analogy from my previous work in the sociology of religion, you cannot understand the Catholic Church in America only by studying what is happening in Rome or among the U.S. Conference of Catholic Bishops. You also have to understand what is going on in the 17 thousand parishes in the United States, and among the 70 million Catholics, who may or may not be attached to those parishes. Concealed carry is particularly interesting because it exists at the nexus of the NRA’s political and service work. Here again, Carlson makes a simple but profound observation: The NRA helps to pass state-level concealed carry laws and plays a central role in certifying instructors. Those NRA-certified instructors then offer NRA-certified courses that fulfill the training requirements for those laws. Consequently, the National Rifle Association is a quasi-regulatory agency governing concealed carry in the United States. The modifier “quasi” is used here in recognition of the fact that the NRA is not a public authority or government agency. But it most certainly exercises autonomous authority over some area of human activity by determining who gets concealed carry permits and what they know when they do. Carlson notes that, “with rare exception, it was NRA-certified instructors who provided Michigan residents with the training certification necessary to apply for their concealed carry licenses. NRA-certified instructors were the gatekeepers of gun carry” (p. 59). This affects the everyday gun carrier more than anything the NRA does in Washington, and also goes a long way toward explaining the NRA’s political influence in Washington. People who carry their guns in public are not just proclaiming their rights, they are exercising them. Indeed, they are embodying them. My next questions for Carlson, then, are both specifically about the role of the NRA, and also a more general question about this work. First, to what extent is your view of the centrality of the NRA shaped by looking at Michigan in particular? Second, to what extent is Detroit representative of an “age of decline” in America? Early in the book you describe southeast Michigan as “an exceptional case.” By exceptional do you mean it is an unusual or an unusually good case? A fifth and final question, if we have time, is: As the most forward thinking sociologist studying guns in America today, where do you suggest we go from here? Where are the frontiers of the sociological – as opposed to the criminological or epidemiological – study of guns? Tags: American Sociological Association, gun carrying, Jennifer Carlson, National Rifle Association. Bookmark the permalink. The CHL requirements in New Mexico stipulate a sixteen hour class including range qualification. The state of New Mexico wrote the requirements but didn’t do anything to design the class. The curriculum was basically written by NRA instructors and enthusiastically adopted by the State Dept. of Public Safety. So that quasi-regulatory agency description for the NRA works for me.